Panorama is strictly protected by copyright. 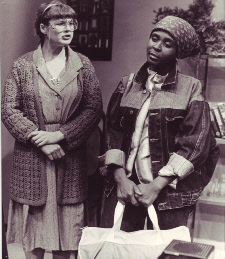 A strikingly symbolic setting invests the play's themes of freedom, liberty and imprisonment with powerful ironic resonances .... Uys argues that while anti-apartheid campaigners languish in a jail deprived of their freedom, these white middle-class women are shackled by their ignorance, fear and even their unwanted virginity ... a subtle, sensitive play. Panorama is a maturely crafted play: each line has layer upon layer of significance; each character strata of biography — they have weight and the encounters crackle with vitality. With words that sting like sand, both tickling and taunting, and images that throw long shadows across the mind, like a cloud over Table Mountain, Pieter-Dirk Uys's new play is an uncompromising view across the bay of our fears and prejudices ... an interesting change of direction. Panorama by Pieter-Dirk Uys reveals once again how the paraphernalia of apartheid can reduce both blacks and whites to the status of social victims ... a cast that sensitively achieves the ironic symbolism of this intriguing play. The play is a conventional naturalistic drama, a well-constructed piece of craftsmanship, a near-extinct product of a culture nearing extinction ... it is not easy to personalize the massive issues in the play without recourse to some form of sentimentalism, but this succeeds brilliantly sounding the last post with awesome clarity. All the old theatrical magic is still there. Just when you think the action is becoming routine, Uys jabs out a string of truths which make South Africans, punch-drunk from too many underhand political blows, realise that the situation is but a charade, a petty play by fools on a temporary stage. The message is unsettlingly relevant and the play itself is hilarious. Pieter-Dirk Uys has found a superb setting for his 'comedy of prejudice' and he has also found a ready-made system of farcical mechanics helpfully laid on by the South African government. By South African standards this is an uncommonly delicate play. South African Pieter-Dirk Uys' well-crafted, compelling play is set in a room with a view. Such a strikingly symbolic setting invests the play's themes of freedom, liberty and imprisonment with powerful ironic resonances. The writing perfectly catches the mixture of good will and ingrained prejudice that characterises many who consider themselves liberal. Panorama is Pieter-Dirk Uys's best play in years ... it is a trenchant piece of writing, a pitch-black comedy which has Uys on his mettle. After the bad experiences of recent weeks, I was beginning to despair of local playwrights and directors. But Pieter-Dirk Uys has restored my faith and good humour. This is probably his best play yet. At times Panorama seems like a comedy, but Uys's purpose is always serious. It has the capacity to go beyond preaching to the converted, which so many local playwrights have been doing. Panorama has shown the way forward for our theatre. Pieter-Dirk Uys has hit the jackpot with his skilfully crafted new play about Robben Island. Using his trump cards of comedy and satire, Uys's multi-layered work exposes the embarrassing lack of communication and understanding that exists between white and black women of equal education in this country. Evidence of his sharp penetrating eye was everywhere.